My in ground soursop and 2 in ground breadfruit have been going thru a lot of 49 degree mornings this winter. The soursop is 10 ft high and has blooms all over it. 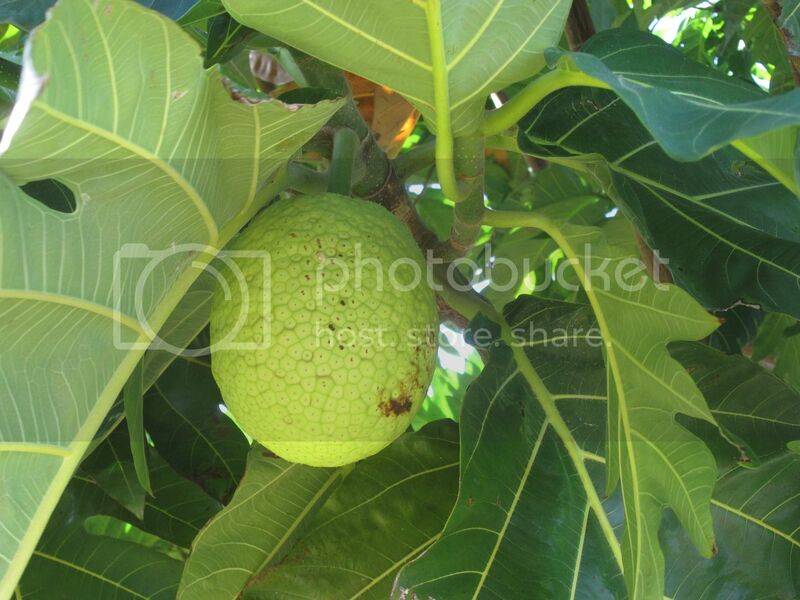 do you have fruit on your bread fruit? I have 2 on mine, here my tree has not stopped growing. I would probably cover the soursop. How large are your breadfruit? I have a small one in a 10 gallon pot, but I never cover it. I will this weekend if it gets anywhere near as cold as they predict. My two soursop are fine with zero leaf loss so far this winter. I am just across the river from Cape Coral. I actually have 4 breadfruit. 2 in the ground, 2 in 25 gallon pots. No fruit. What is the lowest temperature you have seen there this year? I would definitely cover them or at least move the pots to a very sheltered location. I always bring in the ones in pots anytime it drops below 55. From the sea, I saw the pics you posted last year. The look great! You should post some recent pics. This weekend they are predicting 37 to 42 along the coast. My soursop lost some leaves, not too bad. The few blooms I have on it still hanging in there. I didn't cover it. I bought a big tarp, but it was to windy to do by myself, so I put up a smaller one to protect it from the north wind with a 1500 watt heater.the breadfruit all look ok. This pics is a few weeks old. I had a few fruit on my soursop, but the deer are in rut and broke the top off of the tree by rubbing on it. Carlincool, my soursop were unscathed by the cold of last weekend. One of my cocoa is looking rough. Everything else is looking good. If it actually gets into the 30s I will have to really figure out what to do. I think my south yard hit mid 40s the coldest night the north was cold enough to damage sweet potato leaves slightly. No noticable frost anywhere though. How did you get your tree so bushy? Tipping and pruning early? 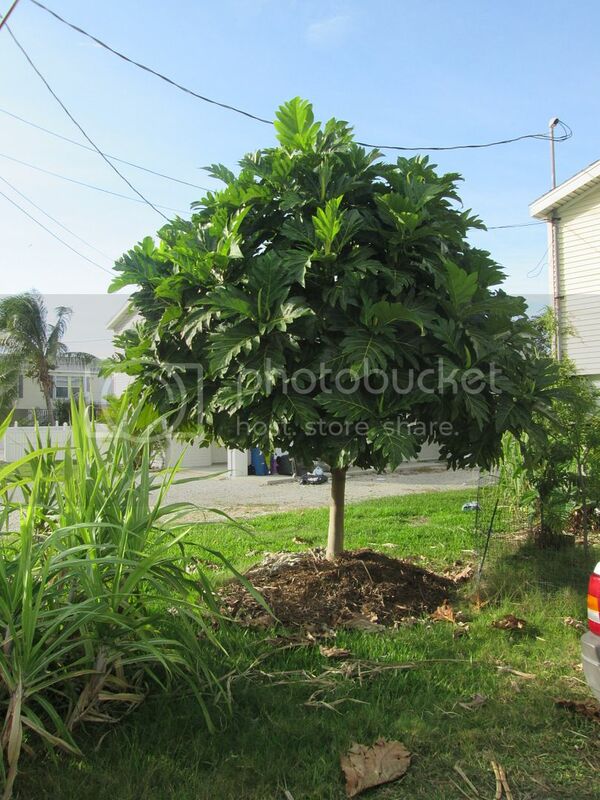 My breadfruit about the same height, but just straight up stick with about 7 leaves on top. Growth pattern irritates me. Don't want to end with a pine tree lookalike. Guessing it depends on variety as well. Well the local news are all saying 39-40 degrees this Friday.. Time to take drastic measures. From the sea..all I can say is wow. What growth since last year. I wish mine looked 1/2 as good. My breadfruit trees have totally stopped putting out growth. It's like they are just existing right now. Hopefully they will be able to withstand some 39 degree weather this weekend. The first year mine was in the ground, it didn't grow all winter but it caught up over the summer. I'm pulling for you with this cold weather pushing through. That is not enough to kill it but it will defoliated. I have a 10' soursop and we had 4 days below 40F first of the year and a week later it defoliated, it is now flushing. I would tarp it to preserve your new growth. My soursop is a young potted one. It defoliated at about 45 when I first got it. I'm afraid to even put the thing in the garage because temps can get that low. It is a house plant in the winter from now on. One of the most ultra-tropical I have. Looking good so far this year, getting AM sun only. I hope your breadfruit pull through the next few days Carlincool. I hope this is the last of the cold. How cold hardy is custard apple? I just bought one last weekend, still in the pot. I have seen a lot of conflicting information. I met someone yesterday who lives in South Fort Myers who had a flawless 7 foot soursop despite her having two or three days in the high 30s, I was surprised by both the condition and the low temperature. My guess is that is a Ma'afala, and yes they tend to do that naturally. But even with them it's good to top them at 10 feet or so, otherwise fruits will become unreachable. That's exactly the variety! I'm planing to top it this spring after the fruit ripen. Tarped everything and added blankets for added protection last night. My low this morning on my property was 51. Tonight is the real test. Weather channel is saying 33. Local forecasters are saying 36-38. We shall see. best of luck, hate the cold.